Next Saturday marks the morning in 1986 when gunman Patrick Henry Sherrill went on a rampage also wounding six others and then taking his own life inside the post office where he worked. Rettke sees this as possibly the last anniversary memorial. “This will probably be the final goodbye to the victims,” Rettke said. Pyle was the brother-in-law of Rettke. Pyle was shot by Sherrill in the parking lot as he tried to reach his car to flee the gunfire. Days after the massacre three decades ago, yellow ribbons started appearing on mailboxes throughout the city. Organizers are asking people again to put yellow ribbons on their mailboxes starting now through the anniversary. “The yellow ribbons really meant a lot to the carriers back then,” said Rettke, who was a city carrier 30 years ago. 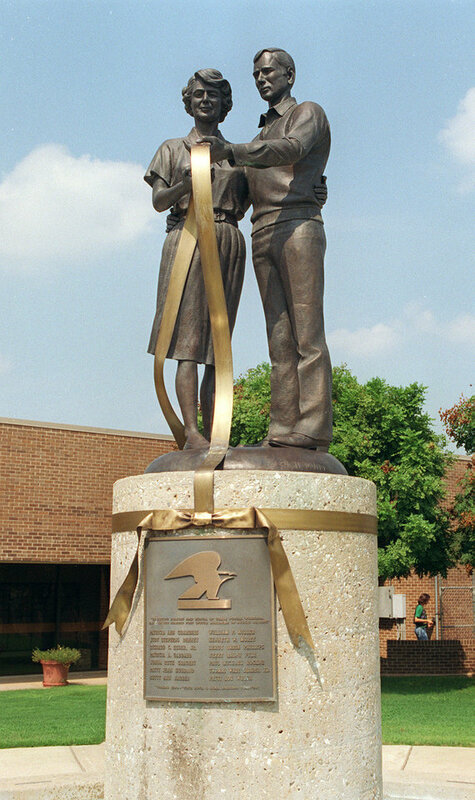 That display of yellow ribbons throughout Edmond 30 years ago is the reason for the flowing ribbon on the memorial statue.